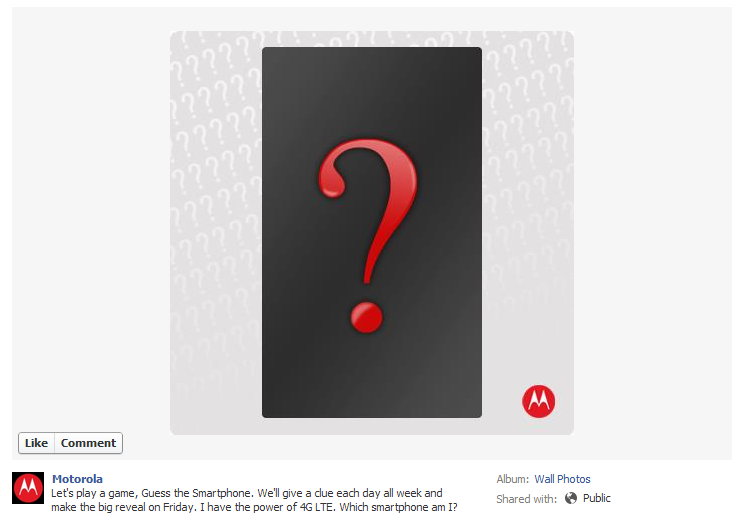 Motorola has taken to its Facebook page with a bit of a game teasing an upcoming device. The company will "give a clue each day all week and make the big reveal on [August 10th]" The first hint? "I have the power of 4G LTE. Which smartphone am I?" If your first guess was "RAZR HD!," then pat yourself on the back, because that's probably right. In fact, unless Motorola has some super top-secret device that it has somehow been able to keep hidden under lock and key for the last several weeks, we can't think of another rumored Moto device coming down the pike. Luckily, we won't have long to wait for the official unveiling. Tomorrow will bring another hint, and the next day another; then, on Friday, the cat will be out of the bag. Hoorah.